Habitat: There are about 300 species. Most of them are native to the cool temperate and subarctic regions of Europe and Asia, and a few species are native to mountains of Africa, North and South America. Description: Lady’s Mantle is a clump forming perennial plant. It has black woody rootstock, short and stout, and finely toothed, kidney-shaped green leaves. The stem is slender and erect, slightly hairy. At the end of the freely branching flower stems grow tiny and numerous, yellow-green flowers. They are borne in loose clusters, appearing from June to August. Parts used: The whole herb, gathered while in flower. Useful components: Ellagitannins, flavonoids, salicylic acid. 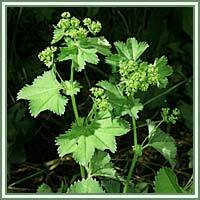 Medicinal use: Lady’s Mantle is an excellent astringent and emmenagogue. Its astringent actions can help stopping both internal and external bleeding. The plant is also very useful for women suffering from heavy menstrual bleeding, menstrual cramps and menopausal symptoms. It can relieve the pain, regulate the menstrual cycle, and can help in treatment of fibroids and endometriosis. Used as a decoction and a wash, Lady’s Mantle can wash of excess vaginal discharge, minimize irritations and infections. Due to strong astringent action of the plant, it can help in cases of diarrhea and gastroenteritis, act as a mouthwash for sores and ulcers and as a gargle for laryngitis and bleeding gums. Decoction is also very useful in treatment of different sorts of skin conditions, including rashes, insect bites and eczema.